I don't know how to say this without sounding like a bougie mother f*cker, but NORDSTROM'S ANNIVERSARY SALE SEASON IS MY FAVORITE SEASON OF ALL. Seriously, their beauty department sale is legendary. EVERYBODY has a gift with purchase, everyone's got special edition gift sets, VOLUSPA CANDLES ARE ON SALE. It is absolutely magical. If you restock your makeup bag once a year, this is the time to do it, baby. Here are my top pics and why. The sale opens to the public in 5 hours, so BRACE YOUR WALLETS. Lancome makes the best mascara. If you think otherwise, I'm sorry, but you're wrong. You're just wrong. This gift set is great because you're getting THREE full-size mascaras (all of which value about $30 a pop) plus you get to try their brand new Monsieur Big (very SATC of them) and a makeup remover all for the price of two tubes. STEAL OF THE CENTURYYYYY. I opted for this instead of the Lash Lover's Mascara Collection exclusively because I was in desperate need of a new liquid liner. I tried the drug store route and I will never go back. Lancome's liquid liner is better than MAC's, Sephora's, Rimmel's, you name it. For the price of your mascara and eyeliner, you also get a small tube of their life-changing Cils Booster XL, a lip gloss, and makeup remover. BOTH SETS COME WITH A PHENOMENAL GIFT WITH PURCHASE (GWP, HENCEFORTH) that includes sample size Definicilis mascara (my fave), Cils Booster XL, an eyeshadow palette, and a lot more. This is the highlighter steal of the CENTURY. The roll-on stick gives your skin a dewey, hydrated look and the pressed powder 1) looks gorgeous, omg, and 2) adds some flawlesss shimmer. The double brush is cool, too; you've got an angled blush brush and the other end is actually a sponge brush, perfect for smudging the stick highlighter and blending it in. For $35, it's a necessity. These candles smell soooo yummy and the tins are super cute. This set has my favorite scents (I am so here for crisp champagne), but all of them are great. They also have a smaller set size that runs half the price, but for ten bucks a candle, that's a deal in and of itself! July 20, 2017 /Alexa E.
Last night was a night of so many new things! We met Nikki Tutorials in the flesh, we tried the Unicorn Frappucino, and I got introduced to Ofra Cosmetics for the very first time. Me and my girl, Jessie Mermaid, made our way down to Pompano Beach last night for Nikki's meet and greet at Ofra Cosmetics in celebration of the launch of their SWEET COLAB, OFRAxNIKKIETUTORIALS! On our way, we preordered two grande Unicorn Frappucinos (sold out all the way to Boca) on our Starbucks app. Some dude tried to tell me I was looking "very good" as I walked past his bistro table in my hoochie-mama outfit, #girlsdressingforgirls, and like the savage I am, I completely ignored him and kept walking. I heard him mutter, "You're welcome," under his breath which was so gratifying, I can't even tell you. We got to the Ofra Cosmetics headquarters for the meet & greet about thirty minutes after it started and it turned out I seeeeeeriously underestimated how many fans Nikkie Tutorials had within an hour radius of Pompano. We walked to the back of the line but were able to snap this sweet pic in front of their sign so how's that for squeezing lemonade outta manure? We added a cat bc 1) who doesn't love cats and 2) the person behind us would not have appreciated that their candid facial expression had been permanently captured. After spending an eternity in line, learning that I CAN TAKE A SELFIE WITH THE VOLUME BUTTON and that a SELFIE LIGHT PHONECASE EXISTS, we made it to the front of the line (EEEEEEE!!!!). We purchased the Nikkie Tutorials BOX SET at a discount (hate us) before the rest of the world could get a chance to again (you can buy it here on April 26th potentially at a discount with the code "NIKKIE") and BOY, is it pretty. 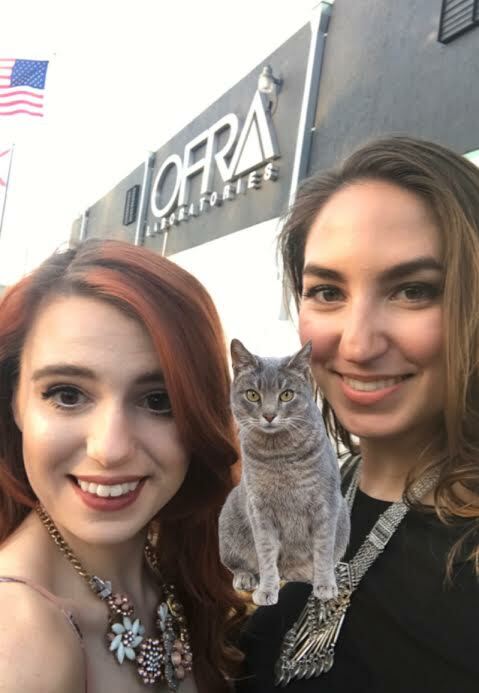 When it was finally our turn to meet the queen, the Ofra team was on POINT. The Ofra rep grabbed my phone and took pictures literally from the first moment Nikkie laid eyes on us. Nikkie was SO FRIENDLY AND SO PROFESH AND MADE US FEEL SO SPECIAL. It was 9:00 at night and she'd been doing this for at least three hours and it felt like we were the first people she'd greeted. So sweet and SO many good pics. CHECK IT OUT. April 25, 2017 /Alexa E.